Key Difference: Ceramic hair dryers are hair dryers that are powered by ceramic heating units. These dryers are similar to the older dryers that were powered by metal coils. Ionic hair dryers are the latest phenomenon and were launched in the market in the early 2000s. These hair dryers produce negative ions on the hair to dry the hair. The negative ions seal the cuticles of the hair causing them to trap the moisture while drying the hair. Hair dryers have become a common appliance that is found in many household these days and are used to dry hair faster compared to air drying. There are various different types of hair dryers that are available on the market. These hair dryers are powered by various different technologies that claim to be better than the older one. Ceramic and ionic are two different types of technologies that are used in hair dryers. These two differ from each other and hence one should check the box and purchase the dryer depending on requirements. Ceramic hair dryers are hair dryers that are powered by ceramic heating units. These dryers are similar to the older dryers that were powered by metal coils. However, ceramic has faster heating capability, resulting in the device heating up faster. Ceramic hair dryers have become common, with the metal coils becoming obsolete. Ceramic heating units also provide even heating and prevent the device from becoming too hot. Hair dryers with ceramic heating units replaced the metal coils as a way to get the dryers to become more efficient and also offered multiple heating settings, including a cool setting. 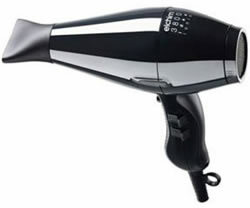 Ionic hair dryers are the latest phenomenon and were launched in the market in the early 2000s. These hair dryers produce negative ions on the hair to dry the hair. The negative ions seal the cuticles of the hair causing them to trap the moisture while drying the hair, resulting in sleeker, shiner and less frizzy hair. The ionic dryer actually shrinks the water droplets in the hair so that they retain the moisture from the water. The non-ionic hair dryers diffuse positive ions that cause the cuticle covering of the hair to open resulting in frizzy hair. Ionic hair dryers are claimed to dry hair faster but they do not make a significant difference over the ceramic hair dryers. Though the purpose of both the dryers is more or less the same, they both perform their duties differently. The ceramic hair dryer emits heated air that allows the water to evaporate from the hair, while the ionic hair dryer emits negative ions resulting in the water droplets to shrink and dry faster. The ceramic hair dryer makes the hair dry and frizzy, while the ionic allows the hair to retain the moisture and gives a good bounce and shine. 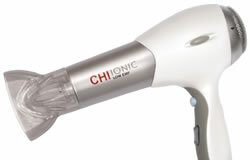 Ceramic hair dryers are less expensive compared to the ionic hair dryers. If getting a whole new ionic dryer is proving to be too costly for just another appliance, one can also opt for getting a ceramic dryer with added ionic feature. The combination of both the dryers eliminates the need for carrying two separate dryers.